OSHKOSH, WIS. (September 19, 2017) – Oshkosh Airport Products, LLC, an Oshkosh Corporation (NYSE: OSK) Company, will showcase a portfolio of innovative technologies at the 2017 ARFF Working Group (ARFFWG) Annual Educational Conference & Training Symposium. The conference, held in Louisville, Kentucky on September 17-20, is the premier event for the aviation firefighting industry. Technologies on display will include the Oshkosh® Striker® Simulator virtual reality training system. Booth visitors will have the opportunity to “test drive” and respond to simulated emergency situations in a virtual reality cab environment. The Striker Simulator virtual reality training system features actual cockpit components from the Oshkosh Striker vehicle, and includes a complete 180-degree forward view as well as an overhead video monitor showing the Snozzle® high reach extendable turret (HRET) in action. The system depicts different environmental and weather conditions such as rain, snow, fog, night, and bright daylight as well as the delivery of dry chemical, foam, water, and even Halon. Other componentry on display includes the innovative EcoEFP™ foam percentage test system. EcoEFP’s patent pending electronic foam proportioning system allows ARFF crews to test the foam percentages without discharging any agent from the vehicle. Also on hand will be the K-Factor™ system display, the new alignment tool that utilizes a sensor on the Snozzle HRET’s piercing tip and a video monitor inside the cab to display a target for the operator. Finally, the interactive RunwayReady™ telematics system display shows remote diagnostics and vehicle readiness capabilities. This unique system enables maintenance teams to remotely check vehicle fault codes, receive maintenance reminders, maintenance alerts, and other data from a smart phone or similar device. Photo caption: Oshkosh Airport Products will showcase a portfolio of new technologies at the 2017 ARFF Working Group (ARFFWG) Annual Educational Conference & Training Symposium. 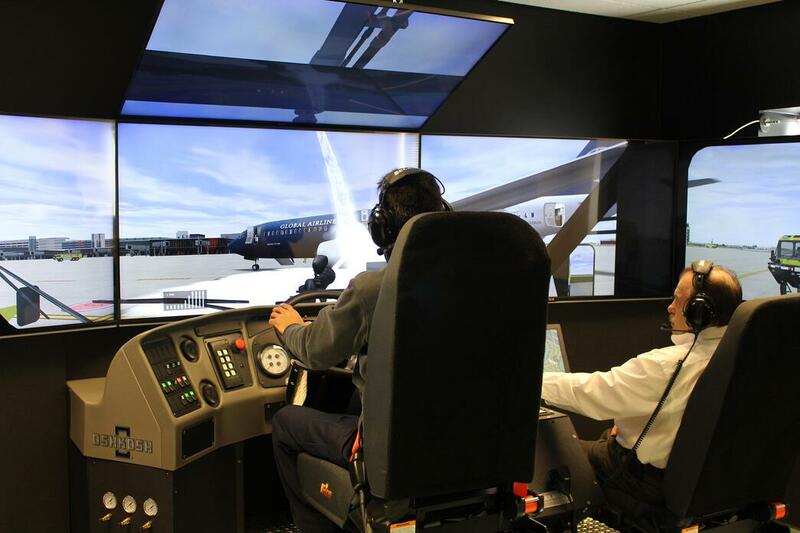 Technologies on display will include the Oshkosh® Striker® Simulator virtual reality training system similar to the one shown here.